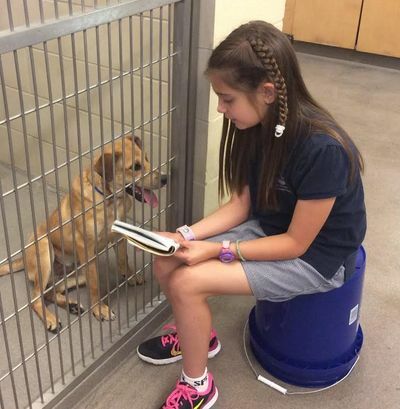 People of all ages are invited to the shelter to read to the animals on our adoption floor! This program helps everyone improve their reading skills, while laos helping the shelter animals by providing socialization and positive human interaction. Cats and dogs find the rhythmic sound of voice very comforting and soothing. They also learn the important skill of sitting calmly with a person. Paws to Read is available Tuesday, Wednesday, and Friday 11am - 4pm and on Sunday 1pm - 4pm. Children under 16 must be accompanied by an adult over the age of 18. We ask that an adult is responsible for no more than 2 children each. On every first and third Tuesday of the month, kids are invited to come read to a McKamey dog at the Chattanooga Public Library from 4 p.m. to 5 p.m. Please click here for more information about this program.